I graduated together with my wife at this year's Winter Graduation Ceremony on the 18th of January. 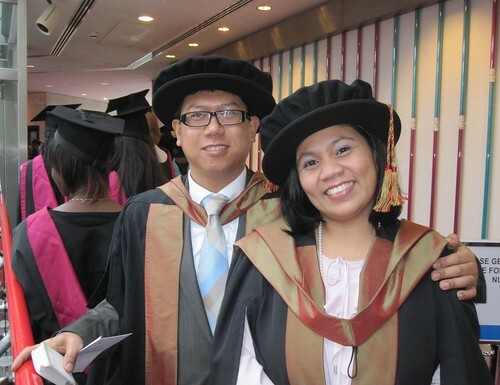 As far as I know, we are the only the married couple to graduate together with PhDs, at the same time. It's quite funny - while we were doing our PhDs, we could not wait to complete it but now that we have, I realise that I really miss life at Warwick. I am currently lecturing at Coventry University Business School and had forgotten completely about this blog until reently. I was discussing the topic "Selling is not marketing" with my students and I remembered that I had written a post about this on this blog a few years ago. A search on Google revealed that my old post was actually #3 in the results. It was really nostalgic going through my old posts and looking at the pictures when I suddenly recalled that alumni members are allowed access their old blogs. I contacted the IT services and they allowed me access using my alumni login. If I am not mistaken, the UNiversity of Warwick is the only University in the World which allows this. Other Universities cut you off the minute you pass out. Says a lot about Warwick I guess. I hope to be able to continue posting updates on this blog form time to time. This blog records some of the thoughts and experiences of Dilip Mutum at the University of Warwick. He has been blogging since 2003 and this is but one of his many blogs. This work by Dilip Mutum is licensed under a Creative Commons Attribution 2.0 UK: England & Wales License.